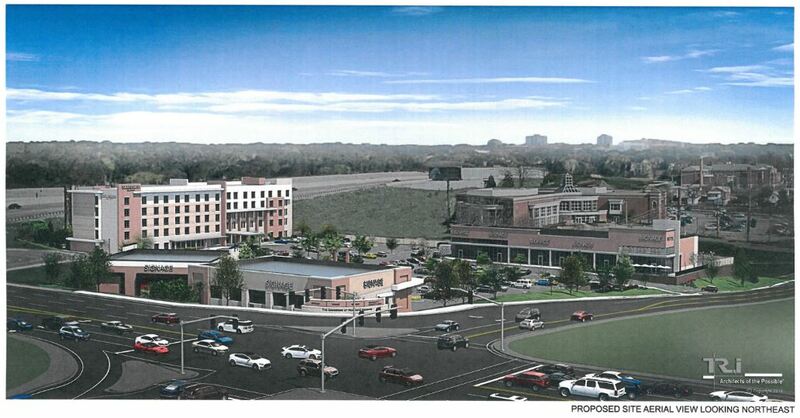 A new mixed-use development a few blocks east of the Brentwood I-64 Transit Center will offer more options and amenities to transit riders. The Crossings at Richmond Heights, located at the intersection of Dale Avenue and South Hanley Road, will include a five-story, 142-room Courtyard by Marriott hotel along with 13,000 square feet of retail space. The Crossings will also offer shoppers and visitors a Cyclebar indoor cycling gym and several restaurant options, including Red Robin, Starbucks, Vitality Bowls Superfood Cafe, Firehouse Subs and Blaze Pizza. The project has an estimated cost of $52 million. This project replaces a 6.4 acre grassy lot just east of South Hanley Road, which is a short walk from the Brentwood I-64 Transit Center. It is also located on the Dale Avenue bike lane. This multimodal accessibility is a major benefit for Metro Transit riders, and for pedestrians and cyclists accessing the stores and restaurants in the area. Summit Development Group LLC, the developer of The Crossings, plans to open the restaurant and retail portion of the project in the coming months, and the hotel by the end of the year. I don’t understand how this is considered TOD. This is a strip center with car-oriented food outlots (Red Robin/Starbucks). It’s walking distance to the Metrolink station behind the Best Buy.